I know I’m not the first to make this joke and I won’t be the last. It is not my intention to turn this into a blog about aircraft modelling, but I wanted to record an update on my F/A-18 model situation. I thought about it long and hard. I considered. I dithered. In the end I took the cheap plunge and bought the Kangnam F/A-18 kit from Sprue Brothers Models via Amazon. On the cutting mat: the bits of the Kangnam F/A-18 I actually wanted to complete my 15-year old Testors model (on the right). In the box: the bits I don’t want. To correct any impressions which have been circulating – the kit isn’t Chinese. It comes from South Korea – hence the very awful joke in the title of this article. It has acquired something a reputation on the web for being a terrible kit. There are no serious reviews, in fact just one that I found saying it’s the worst kit the reviewer has ever seen and stay away. I dunno, I made some fairly awful ones when I was growing up. There was a 1:48 scale Spitfire which had a total of about a dozen parts. In the late 80s I made a Japanese 1:48 scale P-51 that I ended up throwing away (after I’d finished painting it!) because the forward fuselage where it met the canopy looked too stunted, and the canopy itself looked way too big. This at least looks something like an F-18 and has more detail than my infamous 1960s Spitfire. Sadly, the instructions and painting guides are pretty confusing, especially as one painting option is for a two-seat TF-18 (as it was then) which this thing very definitely isn’t. The decals supplied are pretty cringe-worthy and are going in the spares box once I’ve taken a closer look at the warning tabs and triangles. All this having been said. If you’re a parent, shopping for a young modeler, and don’t want to flash out the huge sums of money that go with the mainstream F/A-18 kits ($75 easily), then this might be the way to go. Compared with some of the tat I put together in my younger years it has a little bit going for it. In my case – with a half-finished F/A-18 sitting on the shelf – I would have easily spent over $50 on an aftermarket ejection seat, underwing pylons, weapons, and wheel well interiors (and I only wanted the undercarriage doors). An aftermarket resin seat alone is $7.99 As it is, I ended up spending about $10 on the Kangnam model and got all the bits I was looking for. The single reviewer had doubts about dimensional accuracy – says the external fuel tanks are too small – but I have nothing against which to compare. If you are reading this article and you have a mainstream manufacturer 1:48 Legacy F/A-18 (not the Super Hornet) in your collection, do me a favor. Measure the length of your external fuel tanks and let me know. 🙂 I am still very interested in modeling a Desert Storm F/A-18C in either USMC or USN livery depending on the availability of aftermarket decals. Some seem to have gone out of print in recent years. A couple of things have arisen from this foray into modern modelling whihc I might blog about. One is the NACES ejection seat. Naval Aircrew Common Ejection Seat (?) I forget. But it’s an interesting attempt at standardization by the United States Navy getting one type of ejection seat in a number of aircraft. I will read about it. The other topic is the story of the Hornet and Super Hornet. I kept reading about “Legacy” Hornets and then discovered that the E and F models of the F/A-18 are about 25% bigger than the A, C, and D models. There must be quite the story in there. Meanwhile I’ve been deploying some of my newly purchased Milliput (thought I’d never see it again when I came here) on the Kangnam ejection seat to give it a more hefty look like the NACES version. With the start of the new Academic Year I’ve been a little remiss in posting. Part of my distraction has been because I’ve been researching the story of Lt. Col. Montagu Reaney Chidson, the pilot of the Vickers FB.5 involved in the very first air combat over the United Kingdom in December 1914. It’s quite a story, and getting it into any kind of order may take a while. In the meantime one of my colleagues at Pittsburg State University, Dr. John Daley, is teaching a course on the History of Military Aviation, which I just had to join, so I’m in there auditing it. The textbook we’re using is James L. Stokesbury’s A Short History of Air Power. (London: Hale, 1986). It’s an entertaining book, and contains a few things with which I have had the luxury of disagreeing. John Daley calls these texts a “beer and popcorn” read. So I wanted to show I was ready. I don’t like popcorn too much but this seems to be less of a problem. Accompanied by a few cans of the Tallgrass Brewery’s product, (I hope they can re-commence operations soon), is my copy of Stokesbury, James L. A Short History of Air Power. London: Hale, 1986. After a lot of noises being made offstage about my long-term history project, which I haven’t touched for some considerable time, it’s become apparent that now is the time to do something. I’m hoping that what I’ve learned about blogging, WordPress and historical research may prove beneficial in the time ahead. There isn’t much there right now (you wouldn’t believe the machinations I’ve been through in terms of styles, templates, layouts – or if you know WordPress, maybe you do – and I’m cheap so I’m using all the free stuff) but I hope I’ll be getting some more of my eleven-year old research back into some useful form in the pages of the site. I was torn whether to keep editing my blog article about the FD2 and then realized I could simply write another one, on another occasion. I’m glad I did because a quick riffle through YouTube revealed this gem of British Movietone News. A lovely series of shots of the Fairey Delta and an interview with Peter Twiss (1921-2011) who “happened to be the lucky chap in the cockpit” as I think he put it. I didn’t know Twiss was a former FAA pilot, so it’s fitting in a way that WG774 is displayed at Yeovilton. I was also wondering if there were any current Public Domain or Creative Commons pictures of WG774 and WG777, partly to remind myself what WG777 looked like when I wandered through Cosford in around 1991, and happily of course there are a couple. Here is WG774 seen at the FAA Museum in Yeovilton in 2011. You can see the extent of the modification of the wings and undercarriage. It’s noteworthy as the original photographer suggests that WG774 was selected for modification rather than WG777. Was there an operational reason or was there some arcane political reason for modifying this airframe? We may never know. The 1984 photograph is interesting for me as I first visited Yeovilton a year before – during a heatwave in the late summer of 1983, and this is how I believe these aircraft were displayed at that time. The extent of the modification to WG774’s wings is clear. The HP.115 was a research aircraft which explored the characteristics of delta wings in slow flight in delta configuration and to demonstrate the beneficial extent of extending the delta wing forward along the fuselage. Finally, here is WG777 looking very sleek at Cosford in 2007. Having seen this picture I understand why I didn’t identify the polished silver machine with WG777 in its later dark blue scheme. Such is life and memory. But I salute both aircraft and their pilots. When I was very young, and even at that age fairly air-minded, there were two or three almost contemporary aeroplanes which inspired and enthused me, and seized the imagination of another childhood friend. These were the English Electric / BAC Lightning, The Bristol 188, and the Fairey Delta 2. All of these machines were highly angular, aggressive looking but sleekly beautiful silver birds which we could imagine ripping though the sky at enormous speeds no matter what the defence white papers of the late 50s and early 60s might have said. Only two Fairey Delta 2s were built and, it transpires, I must have seen both of them, long after they were relegated to museums. The first to fly, WG774 was extensively modified (and renamed as the BAC.221) as part of the aerodynamic research into the Concorde’s ogival delta (ogee) wing. (Ogee BTW is trotted out by me in Words with Friends much too often!). It is now preserved in the Fleet Air Arm museum in Yeovilton, Somerset and looks a lot different from the picture below. WG777 is apparently preserved in the RAF Museum at Cosford near Wolverhampton. I have visited Cosford and looked at the research collection and have no memory, sadly. My reasons for blogging the FD2 today are partly because I was reading about the anniversary of the Bell X-1 and its supersonic flight. I thought about saying something about the Miles M.52, whose technology was offered to the United States and which went in part into the X-1, – a proposed exchange which, it is alleged, the American side did not reciprocate. This is all too well written, and I don’t particularly want to keep blogging about anniversaries when Bryan Swopes does more frequently than me and much better. No, let me reminisce of the days when my childhood friend Martin let me play with his second shiny metal Bristol 188 model (he’d been given two by mistake, a nice problem at age 6) and we talked of the FD2 and the Lightning. Martin’s dad Michael, who was a Free-Flight model builder and Radio Ham in his spare time, made a lovely simple balsa wood glider using the Lightning shape. I thought it was the best thing I’d seen for ages. if you’re out there, Martin (I think you are) – all the best to you. Whenever I get a spare moment, I look through the pages of This Day in Aviation in case there is something that catches my eye. Today I saw an item about the crash of the second prototype DH.108 “Swallow” TG306, which occurred 70 years ago today on 27 September 1946. Test pilot Geoffrey de Havilland Jr. (son of Geoffrey senior, the founder and owner of the de Havilland Aircraft Company Ltd.) was killed. The DH. 108 was the first British swept-winged jet aircraft and the first British tailless jet aircraft. It was intended to test the low speed handling of swept wing jets and in that respect was a design study for the future Comet airliner. Its resemblance to the Messerschmit Me163 “Komet” is striking but appears to be coincidental. The Ministry of Supply gave the DH 108 the “Swallow” name, which was never officially adopted by the company. I hadn’t realized, until looking closely at pictures of TG283 and TG306, that the forward fuselage is that of a Vampire, slightly extended, with swept wings attached. 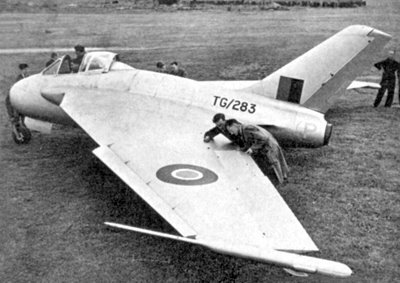 (Train spotters will note the Air Ministry serial of the prototype Vampire F.1 was TG274 – the fuselages of the first two DH.108 prototypes were taken from the production line at English Electric). Eric “Winkle” Brown described the DH.108 as “A killer. Nasty stall. Vicious undamped longitudinal oscillation at speed in bumps”. I found some interesting YouTube footage of the three Swallows including TG306 and Geoffrey de Havilland. Egypt Bay has a personal significance for me, since it’s located a few miles from where I grew up. The North Kent marshes have always been fairly atmospheric. They certainly inspired Charles Dickens, especially in Great Expectations, (the grave that provided Dickens with his inspiration for Pip’s dead siblings is located at Cooling church. Cooling village is visible on the map here), but they also have their share of aviation lore too. The last resting place of Amy Johnson is somewhere in the Thames Estuary – her Airspeed Oxford crashed in mysterious circumstances there on January 5th, 1941. 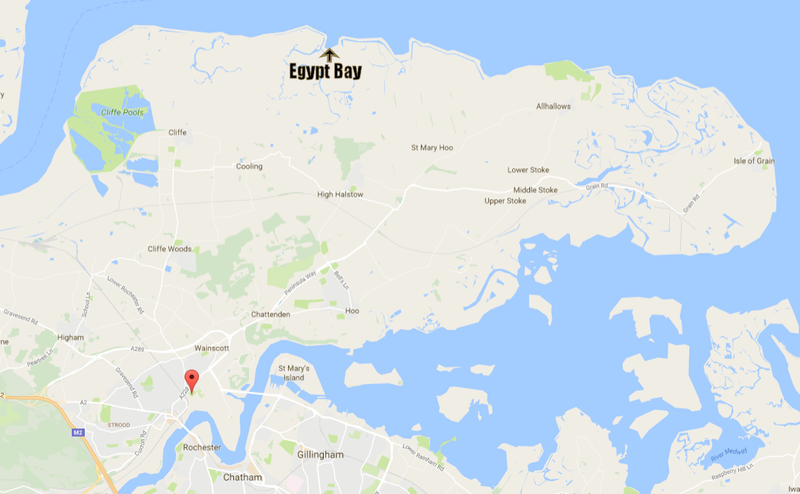 The little red Google location indicator on the map below shows roughly where I grew up, across the River Medway from Rochester, and Egypt Bay is also shown. Just to the east of Egypt Bay is St. Mary’s Bay (not to be confused with many similarly named bays in Kent). Interestingly, searching for “Egypt Bay” in Google Maps elicits no results at all. The wreckage of TG306, according to Bryan R. Swopes, was found on September 28th. Another ten days passed before Geoffrey de Havilland’s body was recovered. He had suffered a broken neck and fractured skull, probably as a result of being thrown around the cockpit as the aircraft entered its “vicious undamped longitudinal oscillation at speed” as Brown described it. This January marks the 10th anniversary of my first serious foray into the blogosphere when I launched the blog “Joplin’s Bomber” on the Google Blogger/Blogspot platform. I’d discovered that the town of Joplin, Missouri, 30-odd miles from here, had exhibited a combat veteran B-24 as a war memorial in the immediate post war era. Not only that, but this specific B-24 was named by the city, and was one of a number of items of equipment which had been purchased from War Bond drives. 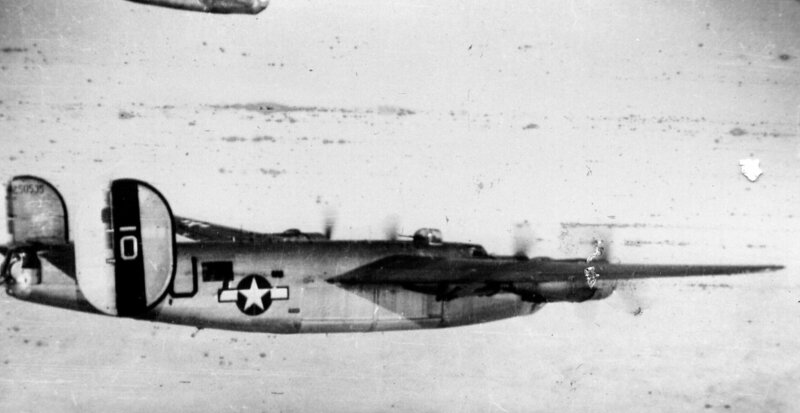 B-24J-1-FO 42-50535 was built on either May 5th or 6th 1944 at the massive Ford plant at Willow Run, Michigan. It arrived at Shipdham, Norfolk with the 506th Bomb Squardon, 44th Bomb Group in July 1944. The aircraft carried the Codes GJ-Bar C – (later GJ-Bar O) and was named “Joplin Jalopy.” She flew 66 (not the 63 often quoted) combat missions with 29 different crews up to the end of April 1945. She was flown home on May 31/June 1 1945. 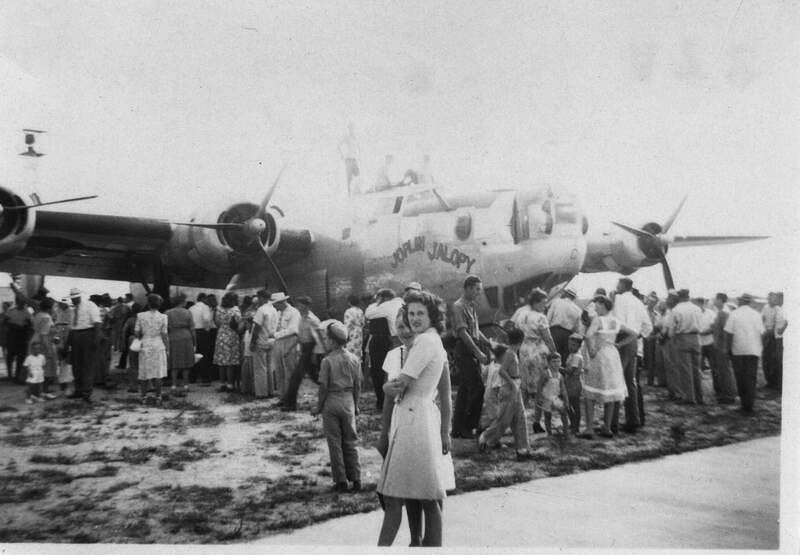 Her next public appearance was in August 1946, when a crew from the Joplin Civil Air Patrol flew the aircraft back to Joplin from Altus, OK where it was scheduled (like the B-17F Memphis Belle, another Altus resident) to be smelted. “Joplin Jalopy” Arrives in Joplin. 11 August 1946. Photograph by Mary Day, passed to me in 2006. Note the feathered propellers, the lack of armament, and the small boys already clambering on top of the cockpit and top turret. Joplin Jalopy and Memphis Belle shared a similar story for a few years. Both suffered the attention of vandals and souvenir hunters. There was no money to build a covered memorial in Joplin. Memphis Belle stood on a plinth at the National Guard Armory in Memphis. The Jalopy sat forlorn on the east side the airport, and her condition deteriorated to the point where she became a dangerous eyesore. She was taken away to be scrapped sometime in the early 1950s. In 2006 I interviewed some of the surviving crew members by email, and journalist from the Joplin Globe called a couple of them up. With the assistance of the 44th Bomb Group Veteran’s Association, I managed to compile a list of all the missions the Jalopy flew, and with which crews. I think that list is complete. At some time I should resuscitate that blog or put my research findings into a more comprehensive site. I would like to acknowledge publicly the assistance I’ve received over the years from Roger Fenton, one of the historians of the 44th BGVA. Roger is the son of a 44th BG Navigator and his dad coincidentally flew one mission with his crew on board the Jalopy. Thanks Roger. There is much to wrote and much which I haven’t yet found, but I should record the fact that while the project may be dormant, it isn’t forgotten.